Grampian 26 ⛵ "Worlds Largest 26 Footer" : Found myself looking at that picture again..
Found myself looking at that picture again..
Found myself looking at that picture again.. On the grampianowners.com website there's a picture in the G26 image gallery showing something I would like to do similarly on mine.. 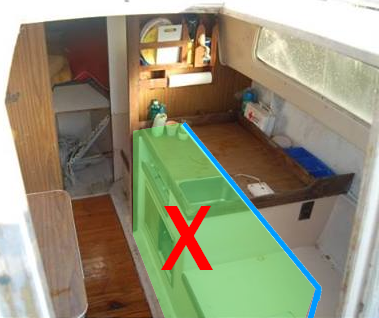 The galley appears to be cut back about 15", thus leaving the cabinet about 14" deep, and not much room left inside on the lower shelf due to the hulls curve, Almost half width of the exposed area of the aft berth is also cut back equal to the galley, and then two quick about 32 degree turns to bring it back out to match up with the rest of the berth and continues as normal beneath the cockpit. This all was obviously was done (or so I presume) for the accompaniment of the wood/coal heater- but the final result also appears to have all but eliminated the boxy interior feel of the entire cabin, and adds an increased sense of comfort and openness in general. It appears the removed portions would not lessen structural support for the hull, however, I suspect it might turn out being a much trickier job than it appears.. If I do end up going this route, it'll have to be well drawn out on paper before cutting anything back. 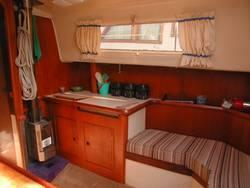 Drawback is that loss of storage space, but it could be recouped, and there's really a lot of storage capability on this boat anyway. It shouldn't be to expensive, and it will be easier to insulate that area while it's exposed during reconstruction, as I will be insulating everywhere anyway. 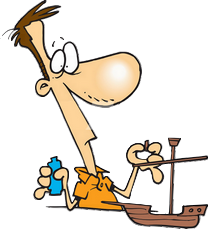 This article presents the research I've done in anticipation of insulating the hull of my sailboat. I'll cover the actual work in a future article. I'm definitely going to insulate, but, at this point, the reconstruction of the galley/aft-berth is still only just a thought; but I really like the idea - which is why I keep coming back to it. A childhood memory concerning boats.. The port windows in the original design..